Find artworks, auction results, sale prices and pictures of Francis Bernard at auctions worldwide. FRANCIS BERNARD (1900-1979) TRAVEL WHILE SLEEPING / YOU WILL ARRIVE RESTED AND FRESH. Circa 1930. 39x24 inches, 99x61 cm. Editions Paul-Martial, Paris. Condition B+: repaired tears, minor restored losses, creases and restoration in margins, some affecting image; creases, abrasions and restoration along horizontal fold. Although this poster is unsigned, it has been attributed to Francis Bernard. Bernard was under contract with the printing house Paul-Martial, working extensively for them as their Art Director until the Second World War. The poster stylistically bears many of his trademark design elements. 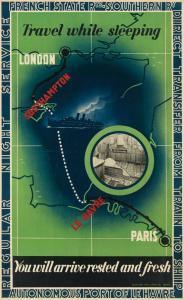 Following Cassandre's innovation for his Étoile du Nord poster, Bernard puts the names of the different railways around the border of the poster. 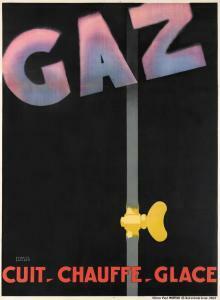 Sale 2449 Lot 77 FRANCIS BERNARD (1900-1979) GAZ. 1928. 62 3/4x46 1/4 inches, 159 1/2x117 1/2 cm. Paul Martial, Paris. Condition B+: abrasions and restoration along creases in margins and image. This poster was the focus of the French exhibit at the 1928 Advertising Art Exhibition in Munich. One of the masterpieces of French Art Deco poster style, it is a perfect symbolic image and an ingenious use of the airbrush technique. Throughout his artistic life Francis Bernard worked for the Salon des Arts Ménagers as well as many other major companies such as Nicolas and Black & Decker. Modern Poster 184, Weill 370, Mechanical Age fig. 3.5, Affiche Art Deco p. 13. 61x46 inches, 155x116 3/4 cm. Paul Martial, Paris. Condition B+: repaired tears, creases, abrasions and restoration in margins and image; vertical and horizontal folds. 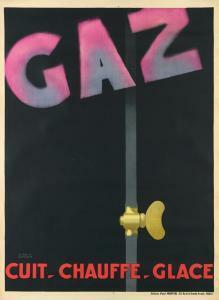 This poster was the focus of the French exhibit at the 1928 Advertising Art Exhibition in Munich. Modern Poster 184, Weill 370, Mechanical Age fig. 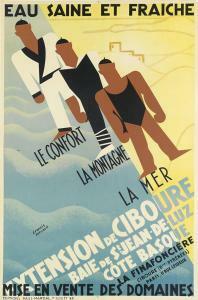 3.5, Affiche Art Deco p. 13. Condition B+: repaired tear at top edge, into image; repaired tears, restored losses, creases and abrasions in margins and image; minor losses in upper right corner. Voyage p. 49, Pyrenees p. 128, La Mer p. 121. 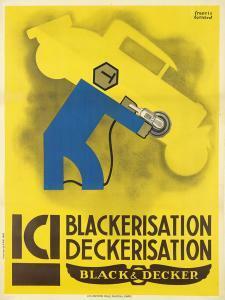 ICI / BLACKERISATION DECKERISATION / BLACK & DECKER. 1930. 62 1/2x47 inches, 158 3/4x119 1/2cm. Paul Martial, Paris. Condition A- / B+: minor creases, abrasions and restoration in margins and image. Francis Bernard was a member of the U.A.M. (Union des Artistes Modernes) along with A.M. Cassandre, Jean Carlu, Charles Loupot and Paul Colin. Although he is the least known of the five, he was, in fact, the pioneer of photomontage in France, as well as the first of the group to work as a full-time art director for the printer, Paul Martial. This is the French version.
. Encyclopedie de l'Affiche p. 87.